Last month 36 people from 18 companies in Italy gathered at Owens Corning’s facility north of Milan for training in MVP’s Flex Molding Process. During the training, conducted by Magnum Venus Plastech (MVP) RTM/Infusion Technical Specialist Charles Tur in partnership with MVP-Italia, attendees learned the various techniques for infusion using the classic bag method as well as constructing and using different types of reusable silicone membranes. The training included classroom instruction as well as hands-on training in building the membrane and infusing a part. 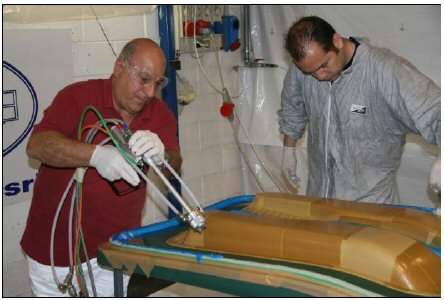 MVP reports that companies such as Lamborghini, which has been using closed moulding and carbon fibre to make seats, dash boards and other components for their cars, were interested in the options available to make more sophisticated, detailed parts that were not possible with Light RTM [resin transfer moulding]. The flexibility of using a reusable membrane and the latest injection systems offered by MVP for epoxy injection into carbon fibre was very appealing to many of those who attended, says MVP.